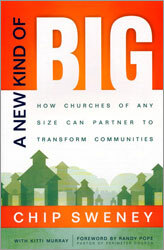 Your church can transform your community no matter what size it is! A New Kind of Big tells the inspiring story of how Perimeter Church in suburban Atlanta started a partnership called Unite! with other area churches in order to increase its reach in a community that desperately needed God's light and aid. This partnership has grown to a network of nearly 150 churches that are bringing incredible kingdom transformation to Atlanta. You too can discover the power of this "new kind of big" to pool your resources, energy, and time with other churches to minister to your community--no matter how long or short your membership roll. A new kind of big: Are you ready to dream big again?